For some time now users were able to see basic coverage in the Anypoint Studio UI. With this new release (1.1.0), users will now be able to see coverage data of the whole application in detail, all this by just adding a simple set of configurations to the MUnit Maven Plugin. Starting with this release of Anypoint Studio, MUnit will be shipped with Anypoint Studio. That means that you’ll get be able to use MUnit without needing to installing it before hand which will create a cleaner user experience. 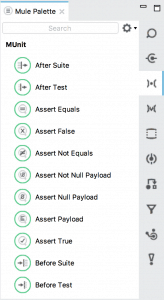 We’ve also create new icons to follow the new Anypoint Studio stile, and added several bug fixes and new features like the ability to only re-run failed tests. For a complete detail of the release please check our Release Notes.